The mesopotamica region is characterized by the plain's prevalence, nevertheless, Misiones is comprised in a subregion, that is a plateau, limited by the Paraná River and its flowings, Iguazú and San Antonio, and the Uruguay River and its flowing Pepirí Guazú and Aguapié. The relief is characterized to be rocky, hard, compact and resistant. The rocks are intense red and it comes from the decomposition of the "meláfrios" that are rocks rich in iron. 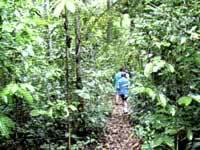 They are called lateritical soils, they cover the whole basement except the rocky shapes and vertical cliffs of the river's riverbanks and they are covered with vegetal humus, which natural characteristics favors the development of the exuberant missionary forest. The plateau present an arched form, its biggest elevations are in the center of the province, they are called Serranías de Inan, Misiones and de la Victoria. These hills divide the province in 2 sections, being Rincón hill the highest peak. It has 800 meters height. 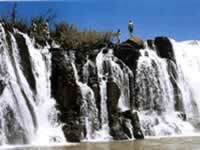 It is in the province's central axis of the plateau, where a lot of rivers are originated. They contribute with their waters to the Paraná and Uruguay Rivers. The plateau ascends gradually towards the northeast to culminate near Bernardo de Irigoyen town, with 821 meters height, The land descent from 520 meters in the center of the province, stops next to the two big rivers in the form of ravines from 50 to 80 meters height. Victoria Hill is placed to the north, its orientation is northeast, southeast and when it reaches the river it forms Iguazú Falls. Their falls are of hardened sandstones and basaltic mantels. Misiones Province natural limits are: to the west: Paraná River, to the north: Iguazú River, to the east: Uruguay River and to the south Itaembé River. It is after the Amazonas River, the most important water via of South America. It has an extension of 1800Km in Argentinean territory. 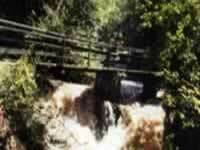 It is navigable along 2100Km from de la Plata River to Adela Port in Paraguay, next to the Guayrá Falls. The river consists of 3 tracts: the High Paraná, between its nascent and its fork with Paraguay River, the Middle Paraná until Diamante (Entre Ríos Province) and Lower Paraná until the fork with Uruguay River. It has its nascent in Brazil and it is formed by 2 rivers, the Paranahiba, that picks up the waters of the Pirineos, Tapioconga and da Matta hills, and the Grande River that has its nascent in Mantiqueira and Espinazo Hills. The High Paraná formed by the fork with the contribution of many tributaries. It is a mountain and plateau river, it has ravines in its banks that are distanced from 2 to 4 Km one from the other, its channel is rocky, serpentine, it presents numerous falls and whirls. 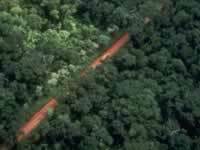 It forms the limit between Paraguay and Brazil and from the Iguazú River fork, it is the limit between Argentina and Paraguay till the fork with Paraguay River. The tract Iguazú - Posadas doesn't offer sailing difficulties, its bed is narrow with high margins and it has up to 50 meters depth. After Posadas, the river changes direction, forming the frontier between Corrientes Province and Paraguay, the ravines, the slopes and the difference of its channel disappears, its width increases to 3Km to the height of Corrientes city, and there are a lot of islands. As a consequence of the abundant rains, it takes a big quantity of water. Its growing begins in October and it finishes in February. In March, the waters descend until August or September. As it is a navigable river, it is used intensely to transport people and loads along Iguazú River. In the passes between Corrientes and Ituzaingo, its minimum depth, 2,70 meters, is kept by dredged. The Argentinean ports built along the High Paraná are: Iguazú, Esperanza, El Dorado, Piray, Rico and Posadas (in Misiones Province) and Ituzaingo, Itá Ibaté, Itatí and Corrientes (in Corrientes Province). In Entre Ríos: Paraná, Diamante and Ibicuy. In Santa Fe: Santa Fe, Rosario, San Lorenzo and Villa Constitución. In Buenos Aires: San Nicolás de los Arroyos, Ramallo, Obligado, San Pedro, Baradero, Zarate y Campana. In Entre Ríos: Gualegauicito, Grande or del Federal and Gualeguaychú. The Iguazú River, forms the limit between Argentina and Brazil. It has 1320Km length and it has its nascent to 900 meters height on Do Mar Hills West side. It flows from west to east through a tortuous bed, little explored. 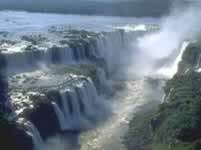 It has numerous falls among which the standing out ones are the Iguazú Falls. It is not navigable. Its basin embraces 68000Km2 surface. It receives numerous tributaries that flow from south to north in Misiones, parallel one to the other. The most important one is San Antonio River. 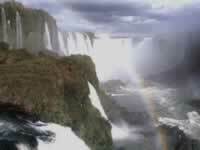 Its name "Iguazú" means Grandes Aguas (Big Waters). They were discovered by Alvear Nuñez Cabeza de Vaca in the trip that he did by land from Santa Catalina (Brazil) till Asunción, to take charge of Paraguay's government. At about 23Km from its outlet in the Paraná River, it opens up in a front of about 2700 meters and its waters precipitate from about 70 meters height in 275 cascades or Falls. The waters fall on two enormous main steps amid a continuous deafening noise perceptible to 15Km distance. The Iguazú waterfalls have 72 meters fall and 1750 m3 flow. During the time of precipitations the different cascades are joined in a big one of about 1Km width.